SAN DIEGO — Construction of Ruocco Park, a 3.3-acre park being built on the waterfront near Harbor Drive and Pacific Highway in San Diego, is moving forward. A groundbreaking ceremony was held last October at the site, which housed the former Harbor Seafood Mart, and the park is expected to be completed this fall. Since then, the Harbor Seafood Mart building has been demolished and the rough grading of the site is nearly completed. New restrooms have already been completed, although they won’t be open until the park is finished. Fencing surrounds the construction site and a pedestrian detour is in effect. This detour — along both Pacific Highway and Harbor Drive — will continue through April, for the safety of pedestrians and the park’s construction workers. Funding for the park is being provided by a $3.5 million grant from the Ruocco Fund and by $3.8 million from the port’s Capital Improvement Program. Ruocco Park will be the Port of San Diego’s 18th public park. Its groundbreaking ceremony was attended by Congressman Bob Filner, San Diego Mayor Jerry Sanders, San Diego City Council member Todd Gloria, San Diego County Supervisor Greg Cox and San Diego Foundation president and CEO Bob Kelly. The park is named after the late Lloyd and Ilse Ruocco. Lloyd was a noted San Diego architect credited with launching San Diego’s modernist architecture movement. His wife, Ilse was a prominent interior designer and professor of art at San Diego State University. The couple started a trust more than 25 years ago to create a park in San Diego that would feature outstanding urban design. The park is designed by Dennis Otsuji of Wimmer, Yamada and Caughey, a San Diego landscape architecture and environmental planning firm. Ledcor Construction Inc. is constructing the park. The park will feature a large-scale artwork by San Diego artist Roman de Salvo, designed to provide a dramatic entrance. It will include an overhead web of eucalyptus tree limbs that will be splayed and spliced together. De Salvo is currently fabricating the artwork off-site. He has milled the tree branches with a chainsaw and is splicing them together to form a sculptural puzzle. Each section will be planed, sanded, treated and installed with the planed surface facing downward, revealing the warm grain of the wood. The natural side of the tree branches will face upward, exposed to the elements. The artwork will include columns and support structures for the sculpture. The sculpture will be suspended by cables anchored to towering masts, evocative of sailboats on the bay, according to the port. 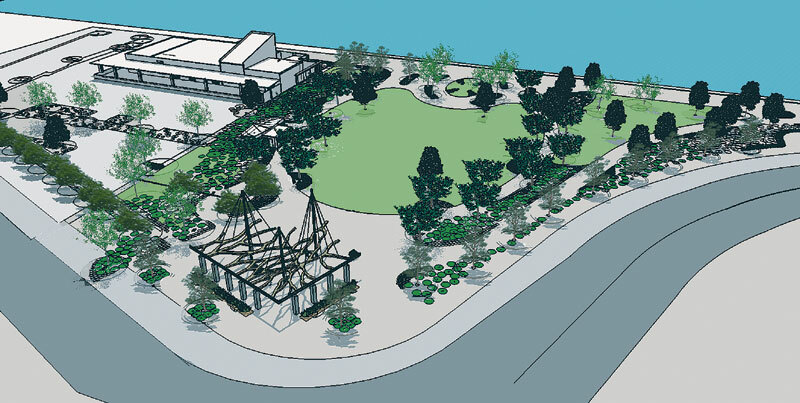 It will be installed in the park toward the project’s completion date.